A few weeks back, I picked up one of the new Trek Belleville’s, and have logged about 300 miles on it in that time. When I was shopping for a new bike, I narrowed my focus to something durable, with 3-speeds, fenders, a dynamo hub, and plenty of racks for carrying loads, so the Belleville fit nicely into that category. Since we officially sold one of our cars in October, making the transfer to a one car family has been easier than I anticipated, though carrying multiple groceries presented a problem. I still have to pick up a pair of panniers, but I haven’t found any that do the bike justice…would love to see something that matches the paint/seat scheme. One standout feature is the beautiful porter rack, but currently, Trek offers no accessories to attach to it. After digging around online for a bit, I ran across two sites that offered nice wooden crates, but both were well over $100, and more than I felt comfortable paying (given the fact that we have two small children and Christmas is a month away). After Thanksgiving, I set to work building my own, which I think turned out nicely. I had a couple of criteria including it must hold a large watermelon, or two 6-packs of beer (priorities). As you can see, it does the job well, though it’s a bit on the heavy side. I’ll attempt another soon, using lighter woods, and probably fitting aluminum on the bottom, with L-brackets on the side, to lessen the weight and amount of wood used. 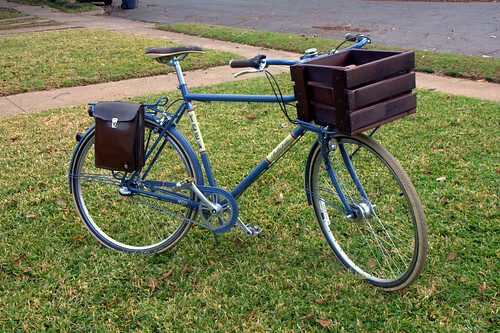 Not sure if you have seen this yet but here is another example of a wooden rack (on a Kogswell) http://lemolobags.wordpress.com/2008/02/20/diy-wood-porteur-box/ I saw your bike at the Tweed ride and meant to take a closer look. The mixte version is just as cool. It’s nice seeing companies like Trek and even Specialized offering utility oriented bikes that are stylish. They’re only $10 a piece, and I agree that they’d make a good fit. 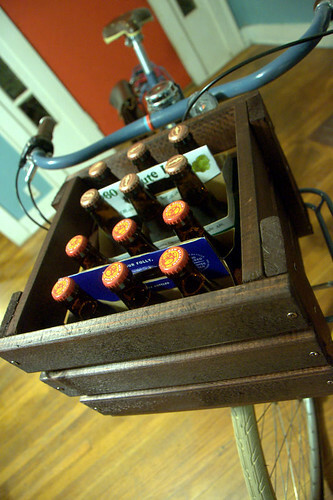 -and will also hold 2 six-packs! the woods used are about a third of the width of yours and are super strong. They’re now being built using dove-tail ends which isn’t on the site yet. and I’ve heard that Swift.Industries is working on a special bag for it! Awesome! Thanks for the links. I love the Bates Crates, and will add it to my xmas list this year. We had a similar dilemma at the shop where I work; we love the Belleville, but what basket to put on the front? The crate looks great! And yes, holding a couple of sixers is very important. How are you liking your Belleville? It’s nice to see someone else using it for commuting as well as those short trips it’s probably intended for. I’m about to pull the trigger on one, too. Since nobody has them in stock locally, my Trek dealer ordered one for me to try before I buy. 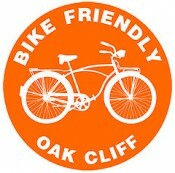 I have a feeling I’ll be walking out of the store with the bike! I like it quite a bit. It’s bulky though, so you have to keep that in mind. Also, I changed out the grips because the plastic they used is very hard with a small texture that feels annoying after a long commute. My average daily ride is about 10 miles, and it’s perfect for that. There have been days I’ve logged about 30 miles on it, and that’s definitely more taxing. It’s really not best for those conditions because you start feeling the weight. It gets a lot of attention. How is the crate attached to the rack? haha! 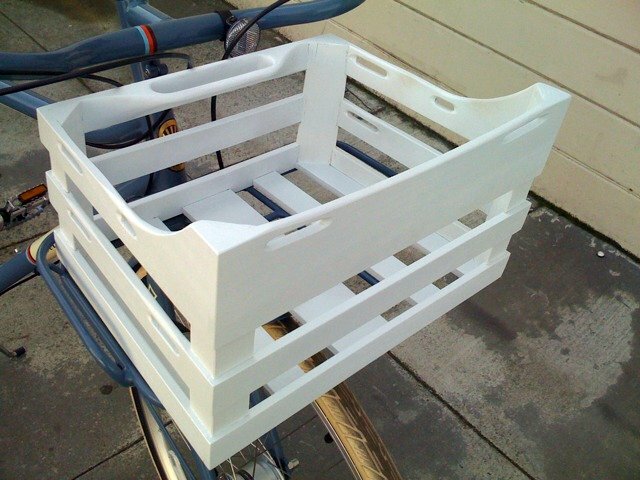 it’s a great use for a crate. the bungees are on there…they might not be as visible due to the size of the crate. Very nice! Where did you order your Belleville from? I’ve called around to all the shops in DFW and no one has one in stock. I haven’t bought (or scarcely ridden) a bike since I was a teenager and I hesitate to buy one sight unseen. Can you tell me where you got the leather bag/sack on the side of your bike? Its amazing!